I got this in the mail today. Even though it is not addressed to me the illlustration, and handwritting font style made me happy. This is a great way to mix art and commercialism. 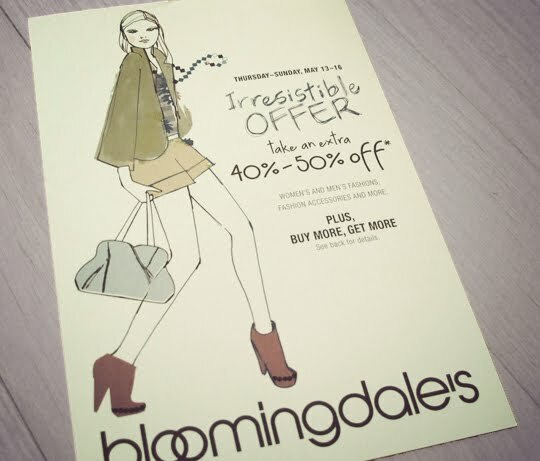 Just because Bloomingdale's is a large corporation doesn't mean they have to be boring. My favorite part of the illustration is the necklace that is hanging in mid air. It conveys the model was moving when this moment was captured by her paint brush, much like photographer captures his/her perfect shoot. Little details like this makes all the difference. These are the things that I notice.